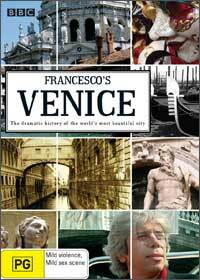 This inspirational DVD takes the viewer on a historical journey through the city of Venice from its early incarnation to its modern predecessor that features stunning CGI cut scenes and re-enactments. For a city that had no access to farmlands or terra firma, this documentary assists the viewer’s imagination through the birth of Venice as a town built with wooden houses on stilts is replaced by stone and brick. The documentary is majestically directed by Francesco da Mosto who is not only an architect and historian but also an aristocrat of Venice whose family has lived in this magically city for over a thousand years. Francesco da Mosto explores with the viewer a true journey as we explore a variety of facets of this city, including the invasions of Napoleon, Byron and Mussolini. This documentary can be enjoyed by both history and architect buffs that at the end of the day, makes you appreciate the vision of the early founders of Venice and how this floating city survived invasion, Mother Nature and even man which continues to survive to this day.